West Windsor, NJ – The Princeton National Rowing Association (PNRA) is teaming up with the Row for the Cure and the Peddie School to host the nation’s only indoor Row for the Cure. Athletes race each other on Concept 2 indoor rowing machines with all of the proceeds from the event benefiting breast cancer research through the Susan G. Komen Foundation of Central and South New Jersey. Racing begins at 9:00am on Sunday, February 26, at Peddie’s Ian H. Graham ’50 Fieldhouse. The Mercer Indoor Row for the Cure will include categories for Junior, Collegiate, Open, Masters, Novice and coxswains as well as a team relay. All races will be 2,000 meters except the Coxswains and Junior Novices who will race 1,000 meters. 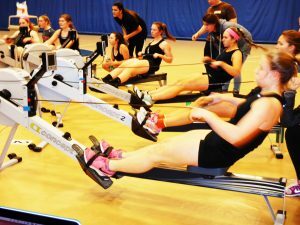 Athletes interested in competing in the Mercer Indoor Row for the Cure can register on RegattaCentral at https://www.regattacentral.com/regatta/?job_id=5023.